The earth has spirit. You can feel it everywhere. But in some places, the power of that spirit makes itself known in extraordinary ways. When I stand at the edge of Lake Superior and watch great waves roll in across that vast stretch of steel blue water and break against the rocky shoreline, the power of Kitchigami (as the Ojibwe call it) is so palpable. On a prairie hill where the wind out of the Dakotas bends the tall grass all around me, I can hear the spirit speak. 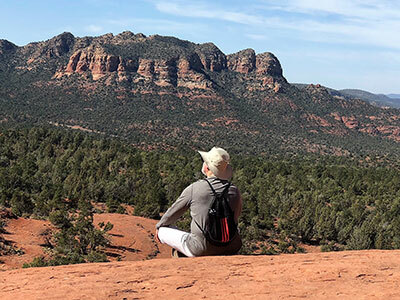 And from the brilliant red rocks of Sedona, where I am right now, the spirit radiates from every cliff face, deep canyon, and high, solitary vista. In our daily lives, we wear blinders. Work, commitments, keeping up with the news, these distractions and a hundred others narrow our awareness of the beauty that is around us always. And so, it’s good to get away whenever we can, to put the human world behind us for a little while and focus on listening, feeling, appreciating the spirit of the earth and all the regenerative power that spirit offers us. It’s important, I believe, to connect with the elemental world, which is so vibrant and alive. Our spirits are strengthened. Our souls comforted. Our hope restored. Now I’m going for a walk and I’ll do my best to be receptive to the beautiful spirit around me. Wherever you are—in a city, a town, a farmhouse—maybe you should take a walk, too. The great, restorative power of the earth is everywhere. Just open yourself to it. Good place to be 1-3” snow just beginning in St Paul. Enjoy Sedona. the valley looks beautiful. Enjoy your time in Sedona. I felt those things when we visited the Medicine Wheel close to Sheridan, Wyoming. It was an amazing place, with eagles souring in the valley below. The wheel itself had a distinct feeling of holiness. Compassion gripped my heart, so I put a feather and a small tock onto the altar and prayed for our Native American brothers and sisters.